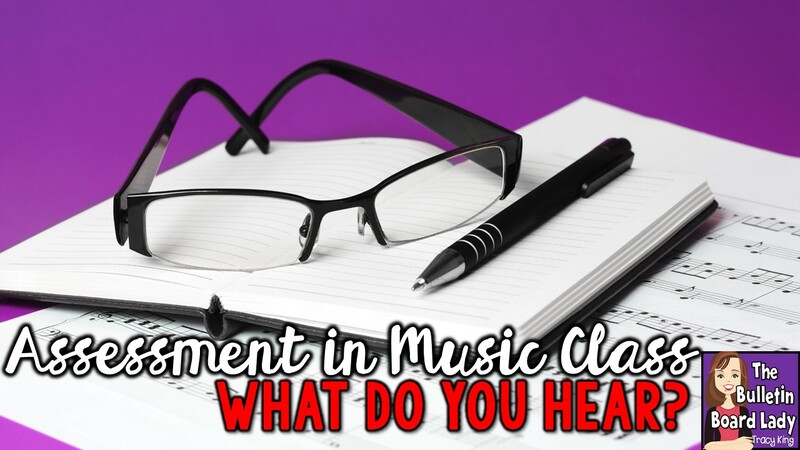 Mrs. King's Music Class: Assessment in Music Class -What Do You Hear? Assessment in Music Class -What Do You Hear? Can I confess something to you? I have no idea how any of my elementary or junior high teachers came up with a grade for me. Not a single one. Did they just "give" me a grade? Did I do something to earn it? Was there every any real assessment? I don't think so. I think that I got an A because I was a good kid that did what I was told. Of course, that must mean that kids that didn't do that would have received a different grade. Is that crazy? Have you been guilty of that? I guess that is one of the reasons that assessment has been so important to me. I've created hundreds of rubrics, sat through dozens of assessment workshops for math and reading teachers trying to glean everything I could and challenged other music teachers to show me how they plan for authentic assessment. I've learned that there is a wide variety of strategies for grading or assessing students in music class. I've seen elaborate data tables and heard others say "I just give them an S, no matter what." Whaaaat? I've tried to find a balance based on how often I see my students and what I want them to be able to do when they leave my classroom. Today I'm going to share with you one of my favorite tools for assessing rhythm skills. I call it ear training, but it isn't exactly what I remember doing for my Ear Training classes in college. I use these assessments most often with 3rd through 6th grades but they could be adapted for use with younger and older students. When I taught high school band I used this type of assessment all of the time. 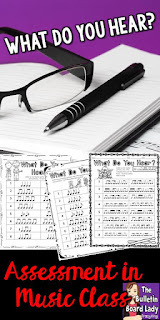 Check out this video to see how I use my What Do You Hear set of worksheets. You can download them HERE if you are interested in trying them out in your classroom. Like this idea? PIN IT for later! We moved quite a bit when I was in elementary school. I don't even remember music class in Maryland (but I do remember art!). In North Carolina, a long-haired chic that played acoustic guitar sat on the edge of the stage and taught us "Blowin' in the Wind," and "I'd Like to Teach the World to Sing." WHY I remember that, I do not know! When we moved back to Texas, the same teacher taught art and music - she played piano. On music days, we dragged out the books and sang songs as she played. Once a 6 weeks, we sang for a grade. We could have as many as 3 (but no more!) in a group. I was MORBIDLY shy and always sang solo - so I wouldn't have to ask anyone to be in my group! Evidently, I sang well enough, that ONLY on grading day did I have "friends"! My guess is we were graded on vocal quality & knowledge of the song (though we could use the books for the words). I grade SO MUCH MORE!!! LOL! We've come a long way, baby!